Winner of the David St John Thomas Award for Fiction, 2000. An entertaining, thought-provoking novel set against a backdrop of intrigue, in-fighting and clashes over sexual morality in a Church of England trying to cope with the first women priests. 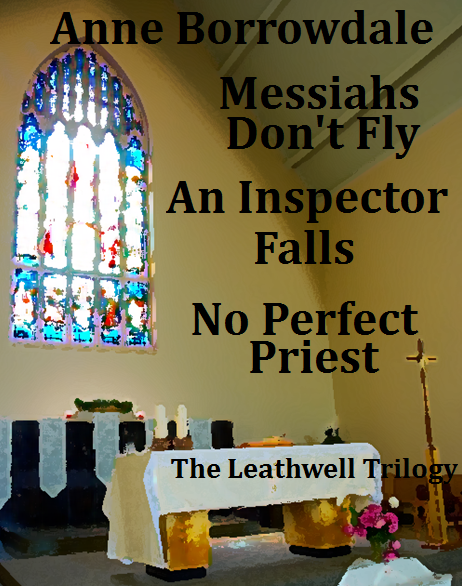 This is the first book in the Leathwell trilogy. The second is An Inspector Falls and the third is No Perfect Priest. The paperback of Messiahs Don’t Fly is currently out of print, but you can buy the eBook as a Kindle edition or a Kobo edition for only £1.99. 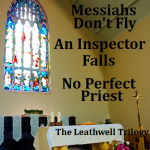 You can also buy all 3 books in the Leathwell trilogy – Messiahs Don’t Fly, An Inspector Falls and No Perfect Priest – in this new e-edition for only £3.99. I’ve finished Messiahs Don’t Fly … I stayed awake till 1am to finish it! When will there be another one? I’m finding Messiahs Don’t Fly quite un-put-down-able … It brings up a lot of questions that need thinking or talking about. When’s the next one? I have just finished reading Messiahs Don’t Fly … and thought it was absolutely brilliant. Now all my friends want to borrow it, so I thought I’d better order another copy. I have just finished reading Messiahs Don’t Fly. … I found it hard to put down and wanted to tell you how much I got out of it. It is unusual … to read a novel dealing with issues like these, affecting real, live people in the real, live church. It is a truth universally acknowledged that a young man who attends church with the slightest degree of regularity must be in want of a vocation. Michael Turner, waiting with easy confidence for acceptance into his chosen profession, had had a lifetime of people suggesting his suitability for ordination. The son of a clergyman, without any obvious talent for anything else, and with an uncomplicated faith that had never wavered, what other path had there ever been to consider? So, after a few years of dedication in low-paid jobs and voluntary work, he offered himself to the system which would test his calling. He glided through interviews in his diocese, winged his way to a provisional place at theological college, and soared through a selection conference, only to crash-land with the letter that awaited him on his return home on an otherwise ordinary October evening. Michael saw the letter as soon as he came in through the door. One of his parents had propped it up for him beside the telephone, aware of what the official diocesan stamp might signify. He was smiling to himself as he pulled off his coat, tossed it onto the rack, and prepared to have his future confirmed. A tug at the flap, the rip of a disintegrating envelope. A single bare paragraph glimpsed through the back of the paper; but such paltriness was to be expected. The Director of Ordinands was the one who told you the detail.